The new Secretary of the Department of Education told an audience of education innovators that she believed the role of technology in education has just begun to "scratch the surface," particularly in bringing "new opportunities" to rural populations. DeVos gave prepared remarks and then took questions from Jeanne Allen, the founder and CEO of the Center for Education Reform, a pro-charter organization that advocates for less federal control in school policy. 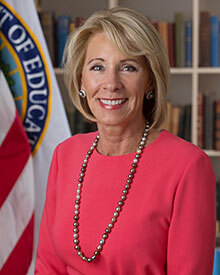 The Secretary's speech focused on the same topics she has been bringing up since taking office after her appointment by President Trump: the need for education reform, incorporating less federal intervention and more state and local control in the regulation and running of schools. She also called on the audience to re-envision what education should look like in the 21st century. "I doubt you would design a system that's focused on inputs rather than outputs; that prioritizes seat-time over mastery; that moves kids through an assembly line without stopping to ask whether they're actually ready for the next step or that's more interested in preserving the status quo rather than embracing necessary change," she asserted." DeVos' suggestion: to get away from assigning students to schools based on the street where they live and "stuck with the same old system where we can predict educational outcomes strictly based on ZIP code." The system we create," she added, "would respect parents' fundamental right to choose what education is best-suited for each of their children. Every individual student is unique, with different abilities and needs. Our education delivery methods should then be as diverse as the kids they serve, instead of our habit of forcing them into a one-size-fits-all system or model." Education would also incorporate new uses of technology, DeVos noted. "Is there a particular thing you've seen that you'd advocate for or is it really a thousand flowers?" Allen asked. DeVos' response: "I think it is the thousand flowers, and we haven't planted the whole garden yet." She said technology especially could play an important role in rural areas in the country to "bring new opportunities" to those populations. While referencing the President's budget as calling for "significant expansion of school choice and parental empowerment," DeVos didn't mention proposed cuts of $9.2 billion (13.5 percent) of the Education Department's budget, which, according to the Washington Post, "is expected to reduce or eliminate grants for teacher training, after-school programs and aid to low-income and first-generation college students." The budget would also shift $1.4 billion to supporting charter schools (a $168 million increase), a "private-school choice program" (with $250 million in dedicated funds to begin and possible growth to $20 billion in time) and $1 billion more for Title I for high-poverty schools, with the intention of promoting school choice. Time to Dump Higher Ed Act? DeVos also touched on a topic of interest to higher ed leaders, specifically suggesting that it might be time to dump the Higher Education Act of 1965 and begin "anew." "Why would we reauthorize an act that's 50–60 years old and that has continued to be amended?" she said. "Why wouldn't we start afresh and talk about what we need in this century and beyond for educating and helping our young people — and adults — learn? The world has changed. We have many adults who are well into careers who want to go back and get a different kind of education. We should be considering the needs of individuals and students, not a system so much." Elimination — or at least a dramatic makeover — could also be in store for the Department of Education's Office of Innovation & Improvement. DeVos proposed that innovation "really needs to be infused in everything Education does. "We're going to be working hard to ensure that every area the department touches is really thinking afresh and anew about what the needs are of students in our 21st century." DeVos defended accusations that she came into the office with no understanding of education policy. "I do know quite a lot about policy," she asserted. "I've been involved in ed policy for about 30 years. My focus is strictly on doing what's right on behalf of individual students. If we can help get that right, it's going to make a tremendous difference for our country's future." She also offered a new name for the department she now heads: The "Department of Lifelong Learning." "I think learning has to be for a lifetime. I think that's even more true today than it was even 20 years ago."